Use this recipe to add Oriental twist to your barbeque that your family and guests will surely love. 1. Wash the spare ribs and remove excess fat. Place them together with the chicken wings in a large tray. 2. In a bowl mix all the remaining ingredients thoroughly. 3. Pour the mixture over ribs and wings. Mix well and marinate for 3 hours. 4. 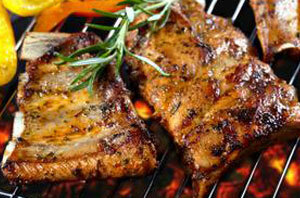 To barbeque, cook the ribs and wings slowly for about 45 minutes to 1 hour. Baste the Kung Po Sauce on the last 15 minutes of cooking. 5. To cook using an over, put the ribs in the over first as they take longer to cook. Bake the ribs for 10 mins at 200C. Reduce the heat to 190C for 50 minutes. 6. Cook the wings in separate try for 30 minutes. Thanks to Wing Yip for the delicious recipe. See www.wingyipstore.co.uk. Wing Yip is the leading Oriental grocer in the UK.